FCC Chairman Tom Wheeler is finding himself in the middle of a seemingly never-ending battle over net neutrality, as over 100 Internet companies sent a letter to the Federal Communications Commission on Wednesday. Wheeler's proposed Internet rules could allow broadband companies to charge content providers for access to the fastest lanes of the Internet -- undermining the concept of net neutrality. However, when he spoke to an audience at the National Cable and Telecommunications Association's Cable Show last month, he assured them there would would be no Internet "fast lane." Still, major companies including as Google, Amazon, eBay and Facebook, as well as two FCC commissioners, are not convinced, reports the Wall Street Journal. Citing reasons of innovation, the letter stated that if reports of the so-called "fast lanes" turn out to be true, it could represent a "grave threat to the Internet." "The innovation we have seen to date happened in a world without discrimination," the letter, from leading technology, e-commerce and software companies, read. 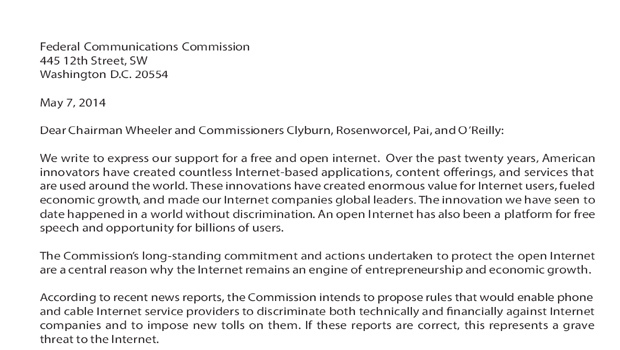 "An open Internet has also been a platform for free speech and opportunity for billions of users." The companies argued that the FCC should protect users and Internet companies on both fixed and mobile platforms against blocking, discrimination and paid prioritization. They also added that the Commission should make the Internet service provider market more transparent. FCC commissioners Mignon Clyburn and Jessica Rosenworcel have suggested that they would not be in favor of Internet rules that could cause any Internet traffic to be treated unequally, according to the Journal. In a blog post dated Wednesday, Clyburn reiterated her support for net neutrality, adding that she had always been a strong advocate and had questioned the strength of the net neutrality rules that had been adopted by the FCC in 2010 -- rules that a federal court ultimately struck down in January. "There is no doubt that preserving and maintaining a free and open Internet is fundamental to the core values of our democratic society, and I have an unwavering commitment to its independence," she wrote. "My mind remains open as I continue to evaluate how best to promote these fundamental, core values." Rosenworcel also referenced the ongoing debate in a speech on Wednesday. Speaking about Internet access in libraries, she mentioned how in 1996, only 28 percent of libraries were connected. Now, that number has grown to 99 percent. "It might sound like the job is done. But nothing could be further from the truth. Because the challenge today is no longer connection -- it's capacity," said Rosenworcel. "And on that front, I think we have work to do." Citing the need for a speedy Internet connection, not only for libraries, but everyday consumers -- who unleashed tens of thousands of emails, hundreds of calls and commentary all across the Internet -- she also mentioned she had some "real concerns" about the proposal. "For this reason, I think we should delay our consideration of his rules by a least a month. I believe that rushing headlong into a rulemaking next week fails to respect the public response to his proposal," said Rosenworcel. In a vote scheduled for May 15, the FCC could open up the proposed rules for public comment, which could ultimately lead to a final vote towards the end of this year.